Summerland's story began in 1883 when Henry Williams bought the 1,050 acre Ortega Ranch. Williams was not a wealthy man. He had sold out his holdings in the east and paid $17,000 for the Ranch. In 1887 the Southern Pacific Railroad was laying track northward along the coast and would soon cross his Ranch. He entered into an agreement with two San Francisco investors to set aside 100 acres for a town adjacent to the tracks. In 1888 Williams decided to create his own town and make it a religious colony. Since he expected that most would come here only for camp meetings, the lots were small (25 X 60 feet), suitable for tents, and sold for $24 each. In 1889 the town was dedicated and named Summerland. Summerland did seem to be "almost heaven". After 1900 the field's production began to diminish and winter storms took their toll on the rigs. The new breakwater at Santa Barbara changed the tides south of the harbor, bringing destruction to what was left of the oil field. 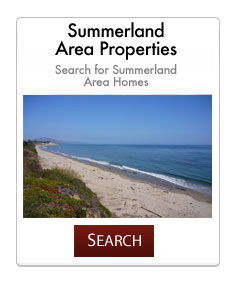 Today Summerland is a thriving beach community with 1,545 residents living in 785 homes, condos, or apartments. The population's median age is 41.7. Summerland is known up and down California for its wonderful weather, friendly residents, good restaurants, outstanding beach, and wonderful antique stores. On low tide you can actually walk along the beach to the Biltmore for high tea, check the tide before trying to walk back.